The series of the first women President of the United States and her PI husband continues in the Good Guy with a Gun. We've moved past the election and the attempt to assassinate the President. However those plots tie in, so if you haven't read other books in the series, I'd go get them first. This series is more like a TV season then separate books. We first have Jim hired by a women who's afraid her husband might be killed for being a whistle blower. However before McGill can meet him, he is killed. His assassin, however, has run into a man that just massacred a number of high school football players and their coaches. The Assassin kills the terrorist and then uses the man's gun to perform his action. 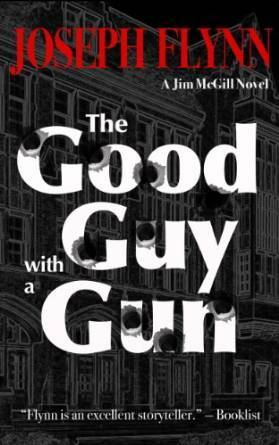 The twists and ties as the President and McGill deal with the shooting, the assasssination, and the previous issues from other books, wind you into a story that becomes hard to follow at times, but slowly comes together at the end. However the end isn't the end, with an ending that leads to the next book. The gun debate in the book is interesting. There are compelling arguments for how to deal with guns in the US and I wish that it was more of a debate in real life.